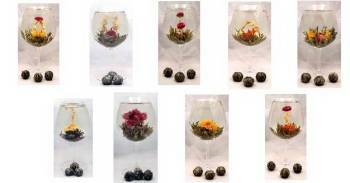 Tea Drops® flowering teas are bundles of tea leaves and aromatic flowers hand tied into special shapes. When steeped in hot water the tea leaves unfurl to create a visually pleasing display that emulates a flower. Choose from black, green, white, oolong or pu-erh tea bundled around a variety of different flowers including rose, jasmine, amaranth and lily. Some flowering teas blossom to reveal 2 or 3 different flowers tied within the tea leaves, while others are intricately tied teas without blossoms.